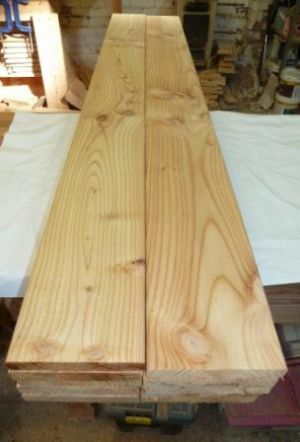 Each pack contains 9 larch boards that have been planed on four sides with an added chamfer on the top side of the boards.The boards are planed through our logosol planing machine. Thats it – no added chemicals or pressure treatment. Ideal for a range of DIY projects, shelves etc. Each pack contains 9 larch boards that have been planed on four sides with an added chamfer on the top side of the boards.The boards are planed through our logosol planing machine. Thats it – no added chemicals or pressure treatment. Ideal for a range of DIY projects, shelves etc.